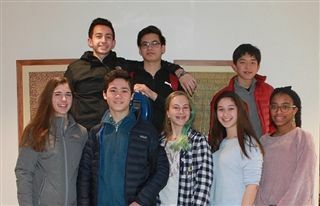 After an adjudication that took place on November 3, seven Kingswood Oxford musicians moved forward to participate in the Connecticut Music Educators Association (CMEA) Northern Regional Music Festival. The festival was held from January 18-19 in New Britain. According to their website, CMEA provides programs and activities for professional educators, students and future music educators striving to enhance the quality of music education for all children and activities for professional educators. The following students represented Kingswood Oxford either for their vocal or instrumental talent: Zeno Chen ’22, Elise Gendrich ’19, Sadie Margolis ’21, Matthew Marottolo ’20, Isa Raymond ’19, Olivia Reynolds ’22, Marwynn Somridhivej ’20 and Adam Theodorou ’21. Kingswood Oxford boasts a robust music department featuring 16 performance groups including a nine vocal ensembles, a Middle School and Upper School string orchestra, a Middle School and Upper School concert band, Middle School jazz band, Upper School jazz combo and an Upper School wind ensemble.